We are almost to the halfway point of conference play, and now have eight weeks of data to look at for the 2018 season. So which teams have been the biggest surprises and disappointments thus far? This is Cal Baptist’s very first season in playing Division I. That’s tough on its own, and somehow they’ve gone 15-5 and are a legit contender in the WAC to make the NCAA Tournament (they’re currently leading the league). They’re obviously not playing a Power Five schedule, but it’s not a pushover slate either. In fact, they come in at #84 in the latest RPI ratings. It’s not too surprising when you look back that in 2017 they went 29-1 in Division II and wound up ranked sixth in their classification, but any time you make that jump and have this kind of success it is an amazing story. The Bearcats have emerged as one of the top two teams in the American Athletic Conference (AAC) with one of the top players in the entire country in opposite Jordan Thompson, who is averaging over six kills per set. Cincinnati was projected to finish second in the AAC, but with wins at Colorado State, on a neutral court against TCU, Florida State and a really solid ETSU team, they’ve shown that they’ve got some national prowess too. They look to be an NCAA Tournament team after going 13-19 last season. The Hoosier’s new head coach, Steve Aird, brought expectations over from Maryland that this team will be on the right track after suffering in the basement of the league last year. What we didn’t know is that Aird, who should build up the program with master recruiting, would have a big impact on the NOW. The Hoosiers have already matched last season’s win total and won triple the league matches in the brutal Big Ten. It won’t necessarily be likely, but there’s actually a path to the NCAA Tournament for Indiana in 2018 – which again seemed more realistic come 2019 or 2020. The Jayhawks still had expectations with talent on the roster and a trustworthy coach in Ray Bechard, but even those expectations seemed to stop at a potential NCAA Tournament team who finishes third or fourth in the Big 12. Then, the team started 4-4. Since that point, some young guns have improved, Jada Burse has caught fire and the blocking has been elite. It’s not a surprise that they’re having success, but it’s a surprise that they are now in the driver’s seat to win the Big 12. 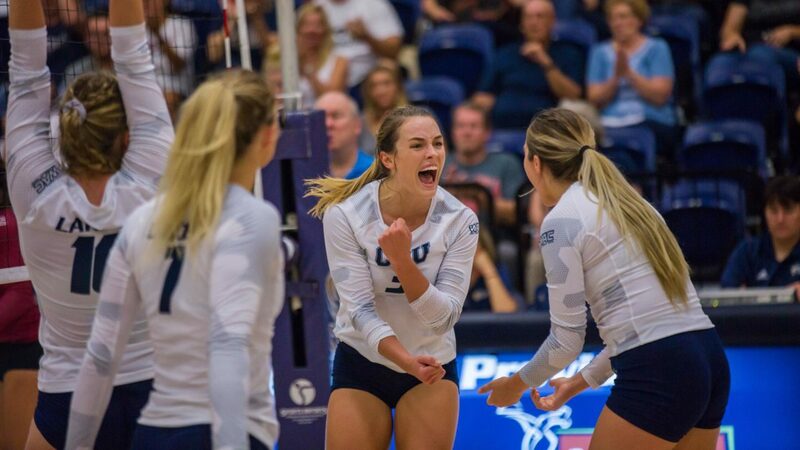 They’ve now got a legit shot at hosting in the NCAA Tournament once again if they can keep the good times rolling and their nine-match winning streak going. Pac-12: Arizona, Arizona State and Cal all fit this description. All were picked to finish bottom four in the league, with Arizona State and Cal selected 11th and 12th. There’s still a chance they all finish in the bottom four or five because of how deep the league is, but what wasn’t expected was that Arizona would be ranked at some point, while Arizona State was close to it (and was in the AVCA). Cal has shown to be stronger than Oregon State at the bottom and looks ultra competitive. It won’t work out that the Pac-12 can get 11 teams in the NCAA Tournament, so the trio will be fighting it out for berths, but all feel like they have a shot. SEC: Texas A&M, South Carolina, Tennessee and Alabama. Those teams were picked eighth, ninth, 10th and 12th in the 13 team SEC in the preseason. Now, the first three are tied for fourth and have hopes of the NCAA Tournament – with South Carolina and Tennessee both on the cusp in our latest VolleyMob Top 25. Even Alabama is far from the bottom of the league and at one point was close to being ranked from us – while they were in the AVCA. All the surprises have given the SEC a ton of depth and a handful of teams with postseason potential. The Golden Knights were picked to finish just fifth in the American Athletic Conference. Then they started 1-2, but what happened next changed the trajectory of this team. They upended USC on a neutral court before taking a road set off of Florida. From there, they have now won 13 in a row. They’re not just a team that could be in the NCAA Tournament or now could win their league after being picked fifth, but with their standing in the RPI, there is a legitimate shot for this team to host in the first and second round. Pretty amazing stuff for a team that will be looking to go dancing for the first time since 2014. There’s a good opportunity for the Bears to turn this around. Last season they won 11 of 12 Big 12 games at one point. So something like that is still on the table. But based on the preseason idea – that was strengthened after they upset Wisconsin – that the Bears could challenge Texas for the league, they haven’t quite hit those expectations. They’re still a good team that will make the NCAA Tournament, but now it’s a question of if they will even have a chance at hosting after that seemed like a foregone conclusion before things started turning sour with a loss to UTRGV. Another Big 12 school; although the Wildcats are on here for a much different reason than Baylor. This one is more so about changing expectations – although they were predicted fifth in the Big 12 and are currently in last. Nonetheless, Kansas State started the year 10-1 and were ranked toward the end of the VolleyMob Top 25. They even took Texas to five sets to start league action. Since then though, they’ve been in a tailspin and went from looking like an NCAA Tournament team to now one just trying to scrap together some wins. The Tigers had expectations that they could follow up last year’s 20-win performance and make another NCAA Tournament, but a 2-6 start to the season really dampened that. They’re also now just 2-5 in SEC play – although they did get a nice win over Georgia. In fact, in the preseason they were pegged to tie fourth with the Bulldogs in the conference. Taylor Bannister has continued her ridiculous performance from year one, but no other player on the team has more than 115 kills. The Toreros are slowly working out of this, and if they can wind up with just three or four conference losses, could still end up in the NCAA Tournament. To their credit they’ve lost some close matches and others to good teams. Even with those though, there was thought that San Diego could lose some of those as long as they could take care of Oregon State, or San Diego State, or Saint Mary’s, or Tennessee twice. That hasn’t been the case and San Diego is now just .500, having gone from a top 20 preseason pick to a team on the wrong side of the bubble for the time being. Of course, with so many teams we probably missed a few! Feel free to let us know who else you have been surprised or disappointed by so far this season in the comments section below.